This article was originally featured in Daily Times Business on April 9, 2018. Written by Gary Puleo. After 60 years, the King of Prussia business park has been rechristened with a name that evokes vitality, while maintaining a bit of mystery concerning its diverse inhabitants and the billion-dollar investment behind it. Moore Park KOP now signifies the identity of the decidedly multi-use location anchored by First Avenue, which has evolved into a “live-work-play” environment that its original developers probably never could have imagined. “The park was developed after the Pennsylvania Turnpike was built in the late ’50s, and the developers built what was common at the time — business and industrials parks in the suburbs built when people were leaving the cities for the suburbs,” noted Eric Goldstein, executive director of King of Prussia District (KOP-BID), the organization behind the park’s grand makeover. No fewer than five hotels call Moore Park KOP home now, including a few that many folks may not have realized were within the park’s realm: the Radisson Hotel; the Casino Tower; SpringHill Suites by Marriott; Hyatt Place and Extended Stay America. At the heart of the business park that employs 20,000 people is Valley Forge Casino Resort, surrounded by notable companies such as GeoBlue, Radial, Arkema, CSL Behring and First Quality Concepts. KOP-BID has been working with the township on the park reboot for the last seven years, Goldstein noted. “It’s all been part of a vision to reposition this business park and make it work for the modern market,” he said. Ironically, while the new name ushers in an innovative era for the business park, it also pays homage to the historic property in the center of it all, the Moore-Irwin House, which served as quarters for General Muhlenberg during the 1777-78 encampment at Valley Forge National Historical Park, a press release explained. 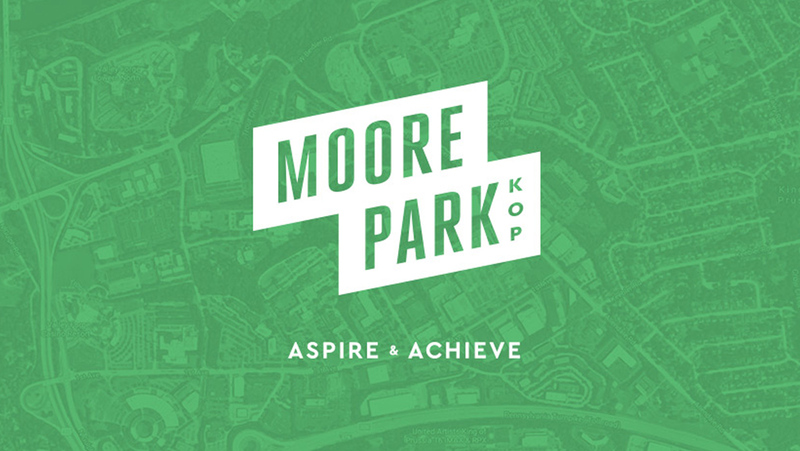 Helping to guide the vision for Moore Park is KOP-BID’s marketing firm, AgileCat, a committee consisting of the business park’s current commercial and industrial property owners, tenants, employees and civic leaders that was formed in 2016, two years after KOP-BID assisted the township in rezoning the park as a mixed-use district. The mixed-use allows for multi-family residential development and service retail for the first time since the creation of the business park decades ago. The new zoning has already paved the way for two new residential projects and has opened redevelopment opportunities for a number of other under-utilized properties, among them Park Square at 751 Vandenberg Road, a $60 million project that features 320 luxury apartments in four buildings surrounded by a courtyard that will begin leasing this spring, and Skye 750, a five-story, 248-unit apartment building that will sit on more than five acres at 750 Moore Road. Phase 1 of the First Avenue Linear Park, a unique collaboration between KOP-BID and 21 property owners along First Avenue, will be completed next year. Last May, KOP-BID treated guests to a preview of the park-within-a-park (then named The Park), a stretch of sidewalks and grass that is much longer than it is wide and billed as a one-of-a kind recreational amenity for King of Prussia workers. The idea stemmed from those early rezoning talks with the township back in 2013, Goldstein had noted. For more information, visit www.mooreparkkop.com.